I know many people are curious about how to make shaders available for Shuriken Particle System to use, the concept is very simple!! 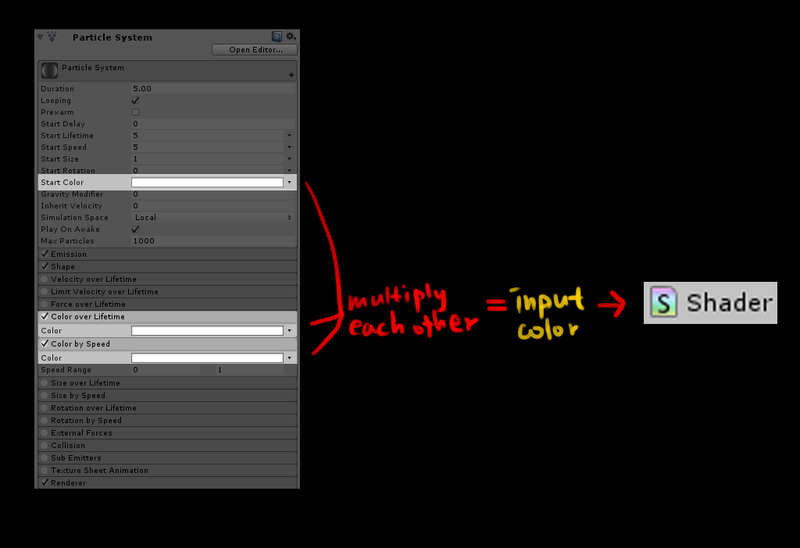 The input color is the only value that particle system can pass to shaders. 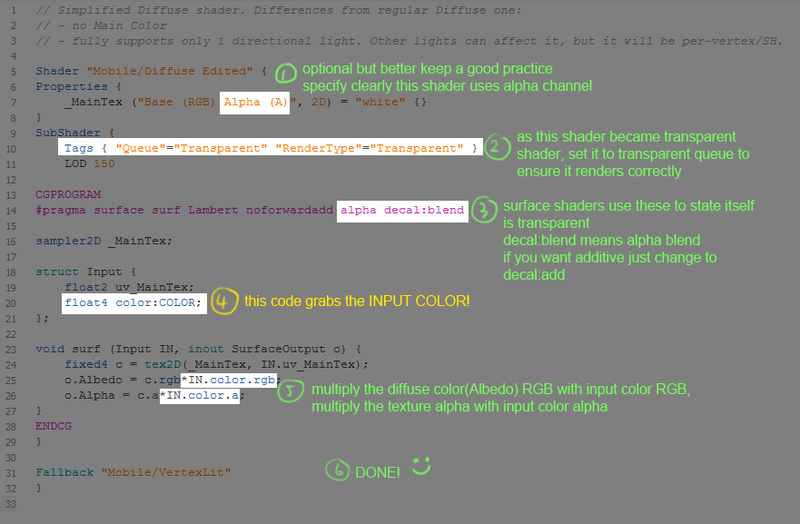 And of course shaders must grab this value and use it to calculate the output color. This is the same case as those GUI plugins like NGUI and Unity 2D sprites, they let you have different colors on different sprites but just using the same material. 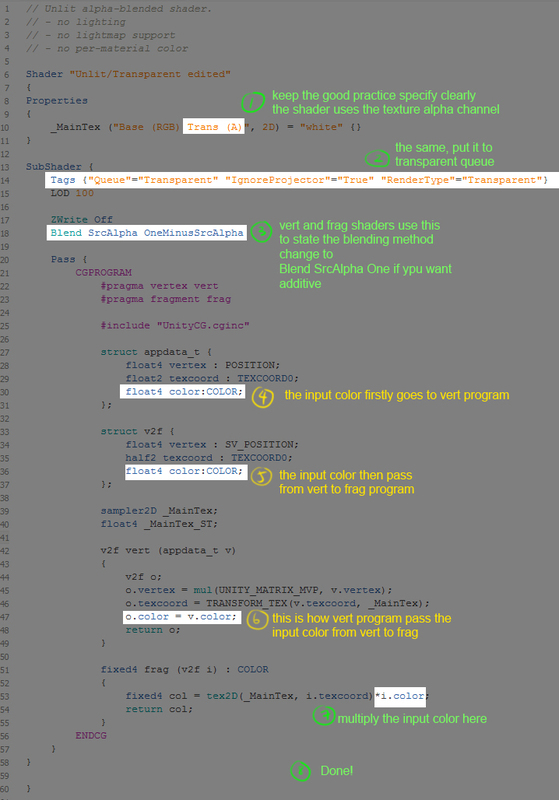 Okay now, so how to “grab” the input color? Let’s start with an SURFACE SHADER example of changing the unity default Mobile/Diffuse Shader into a particle-system-supported transparent diffuse Shader. 2. 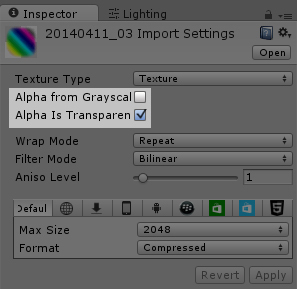 Remember to change the setting of the texture if you want to use the texture alpha value. 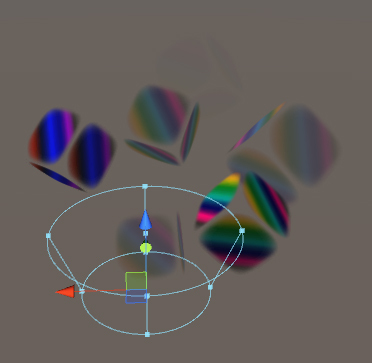 4. you now have a Particle diffuse shader xD! 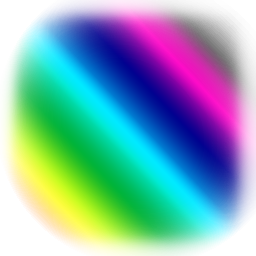 To be inspired, the input color is a float4 value…..that means you have four 0-to-1 floating point numbers to play with! Beside using them to control colors and alpha, they can also be used to control the magnitude of different effects like distortion, dissolve, displacement…more and more! They are of course vert and frag shaders. The dissolve effects used the input color alpha as the variable to decide whether that pixel should be vanished or stay visible.